For just $99 get all of the access you need for the entire team for the Boys season. It includes coach access (normally $34.95) and player access (with player profiles) for up to ten varsity players (normally $24.95 x 10). If priced individually, the price would be $284.45. Recognize your team in the best possible way and get access for everyone. Use PayPal to join quickly. There is an OTZ membership plan for everyone's needs. The cost for the 2019 boys season is $24.95 for fans/parents/players, and $34.95 for high school coaches. The $99 Team Membership Deal provides the most value. It provides Player Profiles for up to ten varsity players, a Coach Profile, and web site access for the players and coach. Examples of the Team Special deal are Mason and Upper Arlington. Click to view their team pages. There is also now an annual membership for college coaches ($40.00). You may pay via PayPal and/or credit card or via check at your earliest convenience. Click below to use PayPal or Credit Card to submit your payment. If you have been an OTZ member during previous seasons, then it is unnecessary to rejoin OhioTennisZone. If you are new to OhioTennisZone.com, please return to this page and complete the form below after paying. This will give you access to OhioTennisZone.com after you have been approved. Just complete the form below and you will be online after your information is confirmed - typically within the same day. Please use your primary email account as your User Name. For a password, please keep it very simple and under no circumstances should you use the same password that you use for other accounts (i.e. eBay, email, Facebook). Who Encouraged You to Sign Up? Submit a Feedback if you have any questions. After you click on "Purchase Membership", please expect to receive an email within five minutes. The purpose of the email is to validate your email address and to instruct you on how to pay. Please acknowledge receipt of this email as quickly as possible. Enjoy the daily commentary and information on the top local players and college players. Check out the results from each team's most recent match. View the high school pictures and videos. This is appropriate for those who use the web site one to five hours per season. Same as above but this is for those fans who use the web site more than five hours per season and who understand how this site benefits high school players, the coaches, and the sport of tennis. 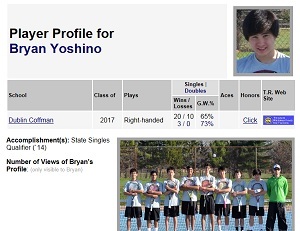 Create a Player Profile report for your player to make it easy to share match results with friends, relatives, and college coaches via Facebook and TennisRecruiting.net. 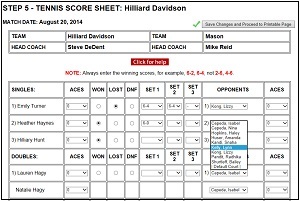 Print a Match Prep Kit report to take to matches so that you are fully informed on both teams. View the complete results for all team matches reported in the Columbus Dispatch and Cincinnati Enquirer. View the full rosters for all teams, including first names, grades, and interest in playing college tennis. View the most recently added photos, and the player and team photo areas. 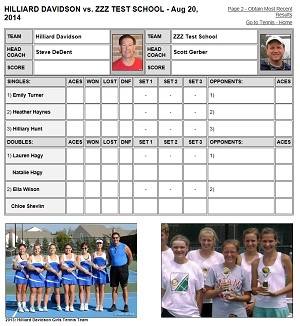 Quickly report your match scores to OhioTennisZone with accurate match results and correctly spelled names. These results may now be quickly forwarded via Twitter. Monitor other teams' line-ups and create the best line-up to help your team win. Obtain all of the information you need to accurately seed your players for end-of-season tournaments and Sectionals. Post the team schedule for fans, parents, and relatives. Create an end-of-season results report for each player as a memento of the season. Obtain an up-to-date list of Ohio high school coaches and their contact information. Are you distributing free memberships? Yes. This site was created to recognize and benefit the kids. Others who can recognize and benefit the kids include members of the press. If they request memberships, they will be provided memberships free of charge. Hopefully this will promote additional newspaper articles from the press. Note that memberships were free to college coaches, but that is no longer the case. Players who wish to share with college coaches may do so by purchasing a Player Profile. Members of the press need to sign up for the $24.95 membership and then contact me to request a complimentary membership. Members of the press need to refer to this web site at least once a season in their articles, just as this web site provides attribution to newspaper articles..
May I share my membership with others? No, and I do monitor this. Prior to the Player Profile reports, some sharing was permitted but now players can share all of their results via the Player Profile report. If I join near the end of the season, what will my cost be? It won't decrease. In fact, there were players who joined after the season because they recognized the value of having Player Profiles.